BindPad is an addon to make KeyBindings for spells, items, and macros. You no longer need actionbar slots just to make Key bindings for your macores etc. anything into one of these slots, and click the slot to set KeyBindings. 2. HOW TO USE "BindPad"? (1) Type /bindpad or /bp to display BindPad frame. (2) Open spellbook frame (p), you bag (b), or Macro Panel (/macro). drop it onto the BindPad window. and a dialog window "Press a key to bind" will appear. (5) Type a key to bind. And click 'Close' button. and press right click to delete it. Note that KeyBinding itself will not be unbinded when you delete the icon. To unbind it, click the icon and click Unbind button on the dialog window. Also you can simply override Keybindings. [General Slots] is for common icons used for every characters and every specs. in the same way as [<Character> Specific Slots]. 'Character Specific Key Bindings' check box at standard KeyBindings frame of Blizzard-UI. From BindPad version 1.5, you can see this checkbox on BindPad window itself too. There are another three tabs called Profile Tab on the side of BindPad frame. Different Profile can hold different contents in [<Character> Specific Slots]. talent specs this automatic change will not happen. 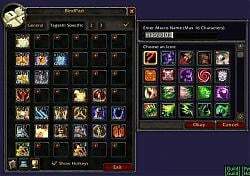 contents of [General Slots] tab is common for all characters AND all specs. 3.3. CAN I SWITCH PROFILE IN COMBAT? ON STANCE CHANGE? simply use the stance condition to decide on what skill to use. or defensive stance and [stance:3] is conditioning you to be in berserker stance. and shadow dance [stance:2] or none of the previous [stance:0]). [stance:6] = Flight if Tree/Moonkin is not available. 4. "You want to convert this icon into a BINDPAD MACRO?"... What? which allow you to make almost unlimited number of virtual macro icons. Older versions of BindPad just let you save your limited action bar slots. - Click the small red "+" icon to create an empty BindPad Macro. 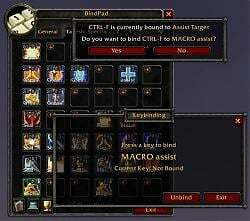 - Right-click an existing spell/item/macro icon on BindPad to convert it into a BindPad Macro. - Right-click the "BindPad Macro" to edit macro-text. - ...and you can use left-click to set keybindings as usual. You can drag-and-drop them within BindPad, but you cannot drop them outside. 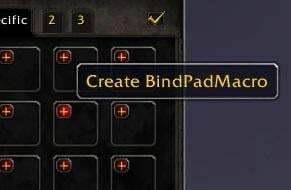 BindPad addon utilizes new functions added from WoW API 2.0 . You can use these functions (and many others) in any addons or macros. There are some other similar addons by other authors. Try them and choose what you like. Visit these links for more informations about keybindings and macros. 6. WHERE CAN I GET LATEST VERSION? - Fixed bug: Changing name for a BindPad Macro broke the keybind. - Fixed bug: Couldn't drag and drop itons. - Fixed Lua Error: attempted to call a protected function (SaveBindings()) during combat lockdown. - Profile Tabs are now assigned to Specializations. - Added 4th Profile Tab for Druids. - BindPadMacro icons are sometimes not displayed correctly while drag & drop. - ToC update for Patch 6.2.
to be lost when LoadBindings() is called after switching Profiles. (Cancel button in Blizzard's KeyBindings frame calls LoadBindings(). - Fixed a bug which spills over new keybindings to another profiles. - Removed SaveBindings() as a fix to random frequent crash at /reload. is placed on a BindPadMacro icon. - Fixed bug which breaks keybinds when players login in combat. - Tried to fix ShowHotkeys option for active telents on Russian client. - Fixed a rare bug which may cause BindPadMacro to stop working. keybind of "Summon Random Favorite Mount" is used. - Fixed bug of "Summon Random Favorite Mount" again. - Keybind for "Summon Random Favorite Mount" can be used while in shapeshift form. by updating for API change of GetBinding function. which was previously only supported for spellLinks and itemLinks. 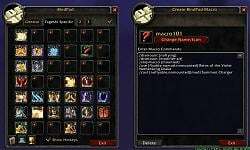 Now we can insert tradeskill links and enchant links into BindPadMacro. - Added support for "Summon Random Favorite Mount" icon on Pet Journal. - Changed 1023 letters limit to 1024 bytes limit for BindPad Macro text. which caused some keybindings to be removed. which makes a keybind to carry over to all other characters. - Fixed bug which made option checkboxes not working. - Fixed mount support for WoD beta. - Removed the workaround as build 18663 fixed Serializer. - Added workaround for WoD beta bug of Serializer for SavedVariables. - Updated for Revision 18645. - Fixed a Lua error introduced on 2.6.6. when player class has flyout spells. - Fixed Show Hotkey option for morhping spells such as Eternal Flame. - Attempted to fix possible issue caused by invalid return value from GetCurrentBindingSet(). - Fixed battlepet support which was broken since 5.1 .
where letters over 1023 was simply ignored when using BindPadMacro. when choosing an icon for BindPadMacro. - Re-adjusted hotkey size and position. on both General tab and each character specific tabs. Now BindPad can hold unlimited number of icons. you couldn't disable "Show Hotkeys" option (it keeped re-enabling itself at login). - Corrected behavier of scrollbar when editting long BindPad Macro text. - Fixed potensial lua error "attempt to call method 'GetAction' (a nil value)"
which happened with Lunarsphere and ButtonForge. - Fixed lua error which occures on riding or leaving vehicle while using Bartendar4. - Fixed lua error related with tooltip of a deleted macro. - Fixed bug which makes redundant keybinding display on a talent tooltip. - Adjusted position and size of hotkey text so that a few more characters are visible. - Show Hotkeys option is back and now more efficient. - Show Hotkeys now supports every actionbar addons as far as I know. - "Show Keys in Tooltip" is included in Show HotKeys option for now. going to be unchecked at login. - Fixed Lua error related to AddSpellByID at Mastery tooltip. - Internal change: replaced StaticPopup_Show with BindPad's own function. for spells, items, and macros on ActionBar and Spellbook. for current BindPad Profile and restore them when switching Profiles. - Reduced memory consumption by removing empty tables. - Removed broken Show-Hotkeys option which was pertially broken from long before. - Added support for "Assist" pet skill. - Added support for battlepet icon. - Fixed bug: Was unable to pick up class spells from BindPad slot. when you meant to insert the itemlink into an active Chat Frame instead. - Updated for patch 4.3 . - Fixed bug: Tooltip for Fishing and First Aid was not correctly shown. - Added new slash sub-commands to manage profiles. /bindpad list : List profiles in saved variables. /bindpad delete REALMNAME_CHARACTERNAME : Delete a profile for REALMNAME_CHARACTERNAME. /bindpad copyfrom REALMNAME_CHARACTERNAME : Copy a profile from REALMNAME_CHARACTERNAME. - Updated for 4.1 . - Added more detailed tooltip text for Profile tabs and Slots tabs. of specified Profile when you click Profile Tab. - Trigger on Keydown checkbox is now hidden. (It now follows Blizzard's "Cast action keybinds on key down"
- Added support for "Move To" pet skill. - Updated for 4.0.6, and fixed huge tab bug. - Added more error check to repair corrupted variables. - Added error check for when your pet is dismissed while dragging a pet skill icon. - Fixed error produced by corrupted variables made by the above error. - Added support for Pet skills (except Move To). - Removed (now useless) Fast Trigger option. - Fixed a tooltip for zhTW and zhCN localization. - Actually fixed problem for Feral Charge (Cat Form), Mangle (Cat Form) now. - Fixed "Show Hotkeys" for standard ActionBar. - Now support Cataclysm Beta Build 12857. - Added a workaround for a strange bug of GetCurrentBindingSet() API function. - 2.2.3 is an experimental version. - Fixed a bug which breaks keybindings for Downranking spells. - Now all keybindings made by BindPad is triggered on key-down instead of key-up. both pressing and releasing a key. control+drag to duplicate a BindPadMacro. - Fixed bug introduced in 2.1.6 which prevented Escape key to close the frame. - Added support for maximum 31 mouse buttons. - Switching profile is now much faster when both profiles have same keybindings. - Now allows bindings to left/right mouse button with modifiers. is "Bronze Drake Mount" instead of the spell name "Bronze Drake". the second one used wrong name and didn't work. switching profile; which also caused display problem of tooltip. - You can duplicate any icon on BindPad by shift-click & drag now. So that you can copy icons from a profile tab to another profile tab. when you have BindPadMacro icons with same name on each profile tab. profile tab was used for each talent spec. Three profile tabs are now equal each other. save & load whole character specific icons and their keybindings. WotLK 3.1.0, and will be automatically switched when you swtich spec. - The third profile tab is just an extra. first time you use a profile. - Fixed: Modifier keys couldn't be used for keybinding of BindPadMacro. For example, "Faerie Fire (Feral)", "Swipe (Cat)"
- Changed keybinding name of BindPadMacro; now it sees like "BindPadMacro:<name>" instead of "BindPadMacro101:" etc. - Now you can use "/click BindPadMacro <name>" slash command to run the BindPadMacro from within a macro. - Added various error checks to avoid calling protected functions in combat. - Fixed: BindPadMacro text was sometimes overwritten by different icon's macro text. - Fixed a drawing order problem of "Show Hotkeys"
for Bartendar4 and probably for Bartendar3. "Show Hotkeys" now supports Bartendar4. Added a workaround for error message "GetSpellName(): Invalid spell slot". - (Really) fixed the display issue of "Show Hotkeys" on compatibility with Bongos3. - Added "Test" button on the BindPad Macro frame to test the macro while editing. bound to a BindPad Macro. rank after respeccing talent or training new spells. Fixed display issue of "Show Hotkeys" function introduced in 1.7.1; Compatibility with Bongos3 fixed. 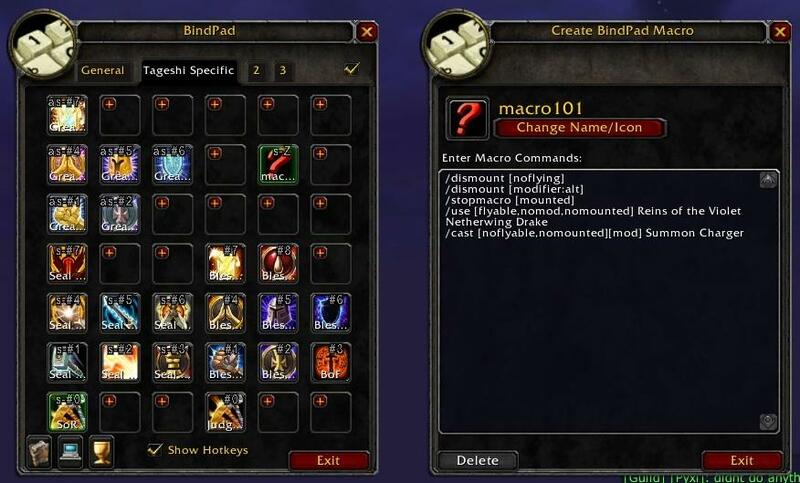 "BindPad Macro" : New feature to make almost unlimited number of virtual macro icons. 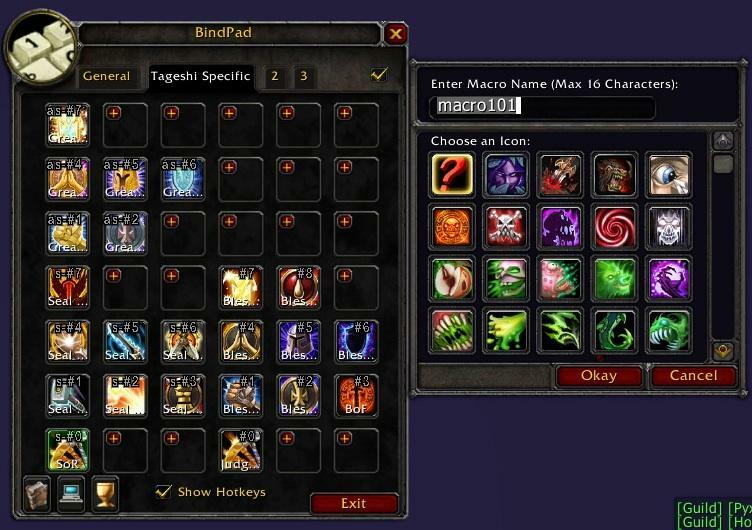 BindPad Macro is made for you to save limited macro slots on the standard Blizzard UI. 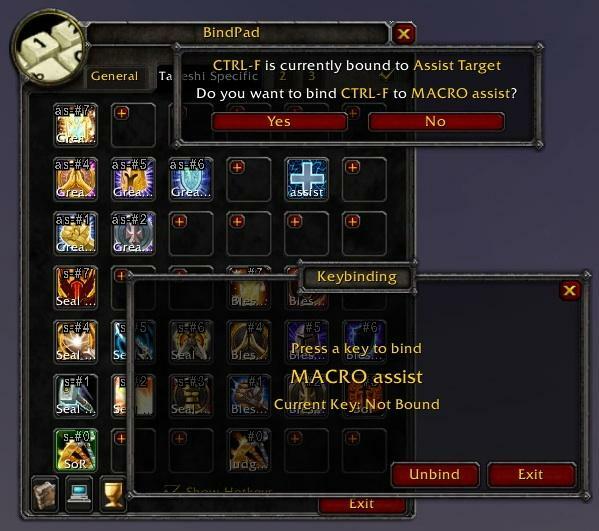 BindPad Macro will only exist within the BindPad frame, and allow you to make keybindings on them. 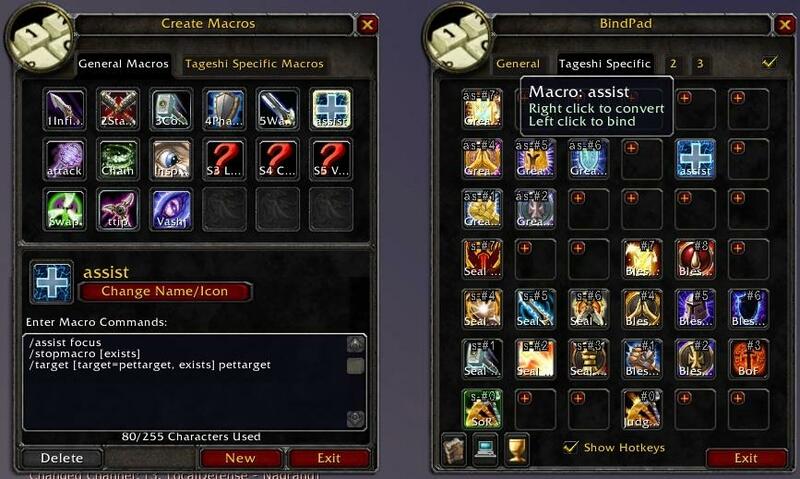 - Right-click an existing spell/item/macro icon on BindPad frame to convert it into a BindPad Macro. Added an option checkbox "Show Hotkeys". The hotkey function now supports all ActionBar AddOns in addition to Blizard UI. Added an ability to automatically display binded hotkeys on ActionBar buttons. Updated for WoW client 2.3.0 . Fixed a bug causing macro icons sometimes not working. Added two extra tabs for heavy users. Added the 'Character Specific Key Bindings' check box at upper right corner of BindPad frame. Added some functions to inform about 'Character Specific Key Bindings'. Added three mini-icons to open Spellbook, Macros Panel, and All bags. You can now drag&drop icons from Action Bars too. You can now use mouse wheel up/down as a keybind. Savefile format was changed and not compatible to 1.0 and 1.1. Bindpad shows all green icons when I use another addon that enhances the window size and adds search capabilities, such as Better Icon Selector/Advanced Icon Selector/LargerMacroIconSelection. Has anyone got any of these addons to work together? I've been using it a couple of days and it has made my life very easy in setting up new characters (my wife and I are serial-alt-o-holics). It works for me, but I don't plan on ongoing support so if that makes you squeamish, wait for Tageshi to adopt (or reject) the change. -- Initialize BindPad core object. ## Notes: BindPad - Keybinding UI for Items, Spells and Macroes. Drag anything into BindPad's slot and click it to bind a key. What that change does is 2 things, 1) it creates a new per-character variable BindPadVarsCharacter which stores individual character data, 2) it migrates BindPadVars[character] data to that variable (once only). Last edited by elaundar : 03-29-17 at 10:56 AM. What is the easiest way to backup my binds before resetting my UI? Every time I try out a new UI, such as off this website, I lose my binds and it takes a lot of work redoing the binds for every character and class. After resetting my UI, even if I keep the bindpad saved variables file, I still have to drag my spells from the spellbook for bindpad to remember what the bind for the spell was, meaning the grids are blank. EDIT: OK I just tested it and I just have to remember to save the .lua file in saved variables and not delete the bindpad folder in addons folder. Last edited by metarra : 12-24-16 at 01:30 PM. Really great addon. I want to ask what the easiest way is of sharing profile between different characters of the same class. Is there an easy way without rebinding everything? Hey, anyone else having issue binding the Legendary Ring? I tried to drag it to the bindpad window, didn't "grab" it. I tried making a macro that would use the slotID, and it still wouldn't "grab" it to configure. Am I the only one with this issue? Last edited by Phweak : 07-23-16 at 04:52 PM. You still alive in there, Tageshi? Or did this whole thing move to the Bindpad WoD Beta page? Anyhow, hope the world is treating you well, xoxo and all that.